More than half of Asian corporates are considering switching to non-bank providers for part of their payments services. Furthermore, 19% are considering shifting their payment services to the non-bank sector, as the appeal of fast, digital settlements continues to grow among companies in the region. Research from East & Partners, revealed at a briefing in Hong Kong today, shows that in other areas, though, companies in Asia are way behind the technological curve. In the case of cybersecurity, for instance, more than one-fifth have experienced breaches to their systems over the past 12 months. But 40% were unaware if they have even been breached, a figure described by principal analyst Paul Dowling as “astounding”. The overall picture painted was a dichotomous one. Asia is often presented as a society in which technology has great penetration, where customers are comfortable with digital products and where much of the innovation takes place. The research suggests that big business is not averse to using technology to improve their finances. The vast majority say their banking has not been negatively affected by digitisation. One-third expect to start using biometrics imminently as a means of making payments more secure. At the same time, large corporations continue to drag their heels – almost 100% of the big companies surveyed by East & Partners still settle payments by cheque. Less than 20%, on the other hand, use mobile payments. Telegraphic transfers are used across the board. All of this makes the noise around a “blockchain revolution” appear fanciful. Banks may well be pursuing the technology’s advancement with vigour, but companies are seemingly less enthused. Belt and Road Another hot topic in Asian trade finance is China’s giant Belt and Road Initiative (BRI), which will attempt to implement swathes of trade infrastructure along the old Silk Road land and maritime routes. For many outside of China, the much-hyped programme has been a damp squib to date: most of the projects has been funded by Chinese banks with Chinese contractors and workers building most of the infrastructure under the BRI umbrella to date. However, Asian corporates view BRI “as an enormous opportunity and potential for business”. Unsurprisingly, given that the cumulative trade volume across 71 designated BRI countries amounted to US$9.3tn last year (28% of global trade), many view it as an opportunity to grow their commerce. Naturally, they want their banks to help them fund this growth. Almost 80% of large companies surveyed by East & Partners are demanding trade finance solutions from their banks to help them capitalise on BRI. Cash management and forex solutions, which go hand in hand with trade finance, are also high on their list of priorities. However, within that, there’s a large subset of companies with knowledge gaps around what BRI actually is and what the opportunities might be (perhaps because the Chinese government is continually revamping and reviewing the scheme, to the extent that one trade finance banker quipped this week: “Everything is now BRI”). Knowledge is particularly low in markets such as Thailand, Indonesia, Malaysia, UAE and Vietnam – all key BRI target markets, where Chinese banks have been dispensing officials in a way to attain corporate buy-in to their projects. For Dowling, this presents an opportunity for trade finance banks to “take ownership of BRI” and to fill in some of the gaps their clients may have. This is particularly true for banks based in Hong Kong: companies who want to benefit from the trade growth spurred by BRI expect their banks to be based locally, with Hong Kong’s transparent regulatory system providing, for those surveyed, a mitigating factor to the perceived risk of doing business on a Chinese-government led initiative. 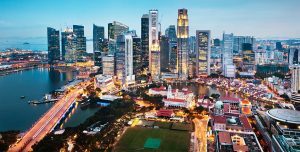 The post Half of Asia’s companies want to switch to non-banks for payments appeared first on Global Trade Review (GTR).